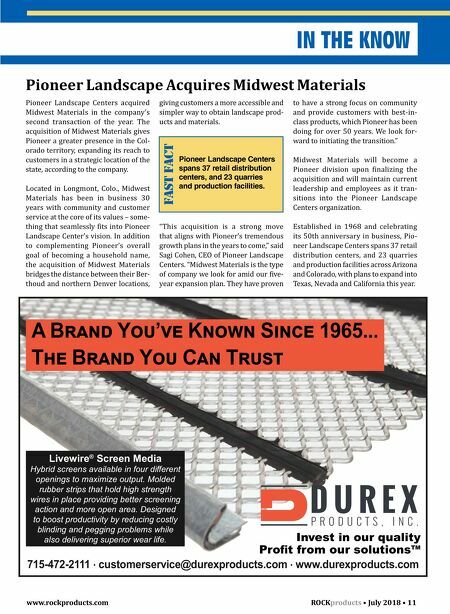 10 • ROCK products • July 2018 www.rockproducts.com IN THE KNOW Industrial General Contractor Specializing in Mining Equipment Installation and Maintenance crmeyer.com 800.236.6650 Piping Concrete Ironworking Design/Build Millwrighting Boilermaking Offices Nationwide Building Construction Equipment Structures FAST FACT First quarter 2018 results include the impact of acqui- sition expenses related to Granite's announced and pending acquisition of Layne Christensen Co. "All three segments delivered strong revenue growth and improved year- over-year margins. Our Construction segment led the way, with the Con- struction Materials segment producing strong top-line revenue growth in our seasonally weakest quarter. The Large Project Construction segment again produced solid revenue growth and improved profitability, driven pri- marily by the contribution of newer projects in our portfolio. While work on under-performing, mature projects had less impact in the first quarter, it remained a drag on overall profitability, and it is expected to negatively impact margins through much of 2018. "The near- and long-term outlook for demand and funding of infrastructure investment continues to improve. Back- log trends remain steady, even with more than 20 percent revenue growth in the first quarter. Large Project Construc- tion segment backlog at $2.61 billion and Construction segment backlog at nearly $1 billion points to continued solid demand," Roberts said. 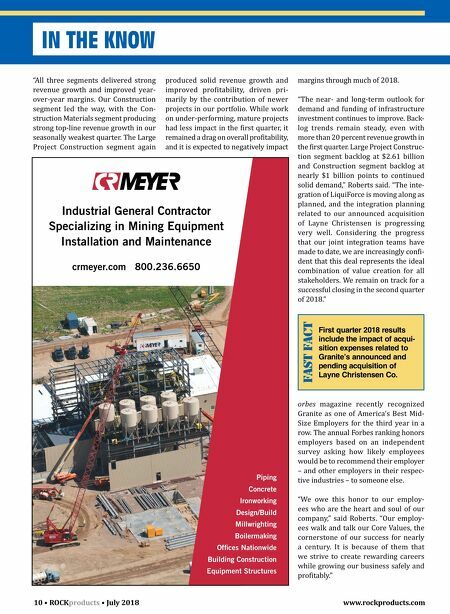 "The inte- gration of LiquiForce is moving along as planned, and the integration planning related to our announced acquisition of Layne Christensen is progressing very well. Considering the progress that our joint integration teams have made to date, we are increasingly confi- dent that this deal represents the ideal combination of value creation for all stakeholders. We remain on track for a successful closing in the second quarter of 2018." orbes magazine recently recognized Granite as one of America's Best Mid- Size Employers for the third year in a row. The annual Forbes ranking honors employers based on an independent survey asking how likely employees would be to recommend their employer – and other employers in their respec - tive industries – to someone else. "We owe this honor to our employ- ees who are the heart and soul of our company," said Roberts. "Our employ- ees walk and talk our Core Values, the cornerstone of our success for nearly a century. It is because of them that we strive to create rewarding careers while growing our business safely and profitably."